What’s It Like to Cruise the Amazon River with Delfin? I never expected to come back from the heart of the Amazon with such an impressive skill—yet here I am, returning to Boston as an expert in towel-animal folding. Turns out, even when you’re traveling far from civilization, some of the aspects of cruising still remain. To cruise the Peruvian Amazon with Delfin Amazon Cruises, one must first get to Iquitos—the largest city in the world not accessible by road. You can arrive via boat or plane, but you’re not getting here by car. From Iquitos, it’s a nearly two-hour drive to get to Nauta, a small town that’s home to Delfin’s embarkation port for its three river cruise boats. 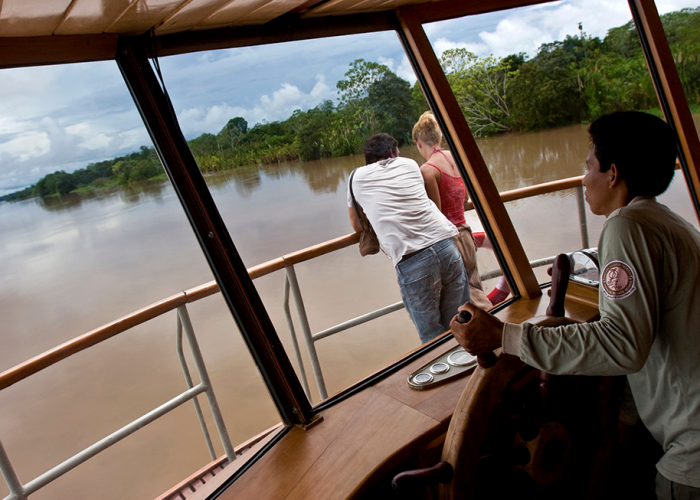 Delfin’s Amazon cruises give you just the right amount of “roughing it” (jungle walks, river swims, lack of Wi-Fi/cell service) cushioned by copious amounts of luxury (three-course local gourmet meals for lunch and dinner, king-sized beds with fine linens, and air-conditioning). 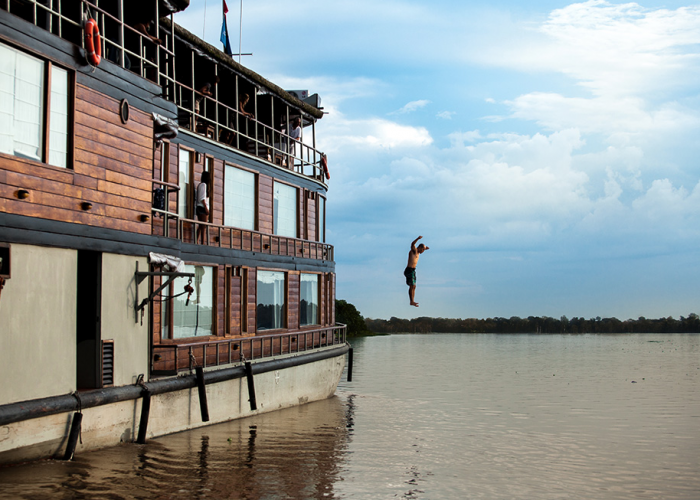 What’s It Like to Go on an Amazon River Cruise? I sailed on the Delfin II, one of Delfin Amazon Cruises' three ships. Compared to a standard cruise ship, the Delfin II is incredibly intimate, with just 14 guest suites holding a maximum of 28 passengers. The suites are as comfortable (and spacious) as a luxury hotel room-but with the bonus of extra-large picture windows that give you an ever-changing view of the river. The rooms are all en-suite (with hot and cold running water) and air-conditioned (which is crucial for the humid nights). All meals are served in the air-conditioned dining room on the second floor, which has large windows that offer a great view from every table. On the top level, you'll find an open-air observation deck furnished with comfortable sofas and chairs to lounge in while you take in the scenery. This is also where the bar is--and the place to get a freshly squeezed local fruit juice as a refresher after an expedition. Note that juices, beer, and alcoholic beverages are not included in your cruise on the Delfin II, although water and coffee are. As tempting as it is to spend all your time relaxing onboard the Delfin II, the excursions are the real reason to sail the Amazon. 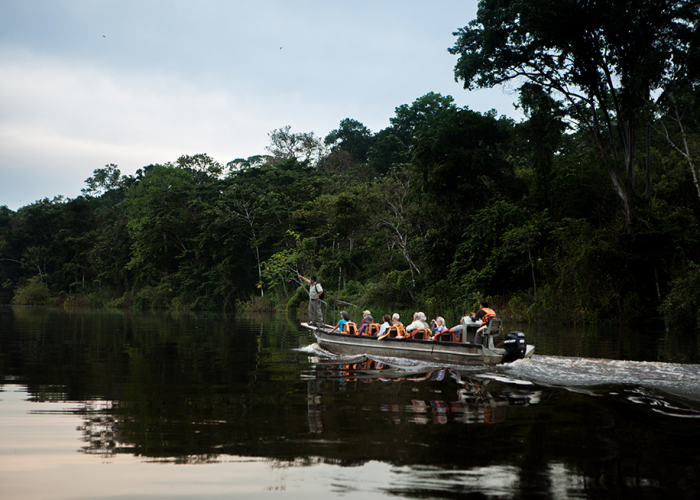 Excursions run at least twice a day, and on my boat included kayaking, jungle walks, a nighttime visit to a local shaman, a village tour, skiff rides, and swimming in the Amazon. Every expedition from the Delfin II is led by an experienced local naturalist--all of whom are full of expertise and patient with questions. Each day begins with a breakfast buffet that includes a full table's worth of fresh fruit from the rainforest. I enjoyed the opportunity to sample so many fruits that I had never even heard of before this trip, like Pitahaya (similar to a kiwi) and Mamey Sapote (similar to my favorite fruit, mango, but even more delicious). 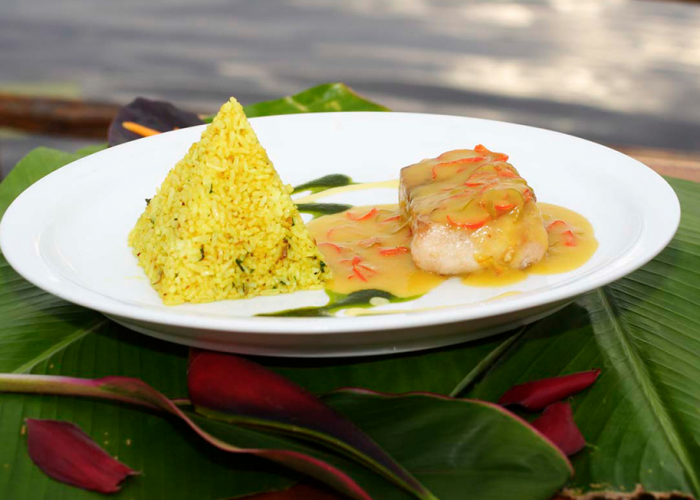 Lunch and dinner are both three-course meals using ingredients sourced from the river and rainforest. I am a vegetarian, and my meals looked just as inventive and tasty as the standard meals. If you have a special diet, Delfin is willing to accommodate you, as long as you let them know ahead of time (so that they know what to bring onboard). All of the food is prepared using filtered water, so everything is safe to eat, even if it's not cooked. There was plenty of entertainment offered onboard as well, including the aforementioned towel animal-folding class. Some of the more lively activities included a Pisco Sour-making tutorial and evening Peruvian musical performances from the staff, both of which had passengers up and dancing by the end. My experience on the river cruise would not have been as great if it hadn't been for the dedicated staff. The Delfin II has a crew of 20, which ensured plenty of personal attention. Everyone onboard was caring, friendly, and committed to making sure all of the passengers were having a great time. 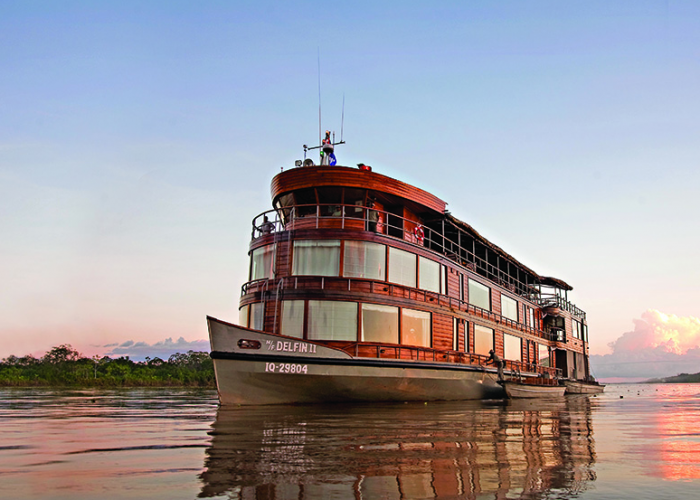 Would you ever consider taking a river cruise down the Amazon? Tell us in the comments! Caroline Morse was hosted by Delfin Amazon Cruises on her trip to the Amazon. Follow her on Instagram TravelWithCaroline and on Twitter @CarolineMorse1 for photos from her adventure. For more information about Delfin Amazon Cruises, visit www.DelfinAmazonCruises.com.